The best companies for leaders generate dramatically greater market value over time than the weakest companies for leadership development. Leading public company CEOs commit a higher priority to leadership development in spite of the added burden of more complex and “distracting” environments with added pressures for short-term financial results. Smaller and private company CEOs spend more of their personal time (25 percent versus 15 percent) on both developing others as well as developing themselves, but are less likely to install systematic processes for leadership development. Bob McDonald, CEO of P&G, which returned as this year’s top-ranked company for leadership development after a five-year hiatus. “I see my role as the chief talent officer of the company,” says Procter & Gamble CEO Bob McDonald. “Leadership is the one factor that will ensure our success long after I am gone as CEO.” The West Point graduate and former brand manager for such products as Tide, Cascade and Dawn believes leadership development is central to the consumer product giant’s ability to grow earnings and cash flow in low to nogrowth economic times. Since the ranking’s inception in 2005, P&G has numbered among the top-tier firms of Chief Executive’s Best Companies for Leaders. The ranking is based on a study of about 1,000 firms worldwide conducted in partnership with Chally Group Worldwide (www. chally.com), a Dayton, Ohio, sales and management productivity firm. Companies were scored on four key criteria, including: 1. Having a formal leadership process in place; 2. The commitment level of the CEO, as measured by the time and quality of involvement with the leadership process and development program; 3. The depth of the leadership funnel as measured by the percentage of senior management positions filled by internal candidates as well as the percentage of middle management positions filled by internal candidates; and 4. The number of other companies that report recruiting from the company being evaluated. To this narrowed list, we factor in a shareholder value performance metric, slightly modifying point totals where necessary based on 10-year growth or decline in market capitalization. This generally results in only slight ranking adjustments, as any company making the list is a champion apart from most others. In fact, aside from P&G, the remaining top 10 scored within several points of one another, with the second 10 on the ranking scoring no more than six to 10 points below the first 10. The Best Companies for Leaders survey tracks changes and developments from year to year. For example, this year some differences in priorities and challenges facing CEOs in public versus private companies were observed. Because it would be inappropriate to compare private companies with larger public companies that enjoy greater resources, we list separately the most noteworthy private firms with in-depth leadership development programs. Respondents this year also made it clear that when succession from outside the company becomes necessary at the highest levels of management, companies depend on external recruiters. They charge these agencies with pursuing candidates from either other companies with the greatest reputation for leadership development or admired competitors with market expertise in their industry. Several key factors most affect company rankings, including a company’s reputation among its peers as a source for well-rounded talent. Also considered is the CEO’s personal involvement in a company’s internal process. For example, this criterion is one reason American Express dropped from last year’s ranking and PepsiCo rose 10 ranks on the ladder. The pages to follow offer a look at the top five companies on this year’s list, highlighting some of the reasons they secured their top-tier positions. The full Best Companies for Leaders report will be available in early February at www.chally.com. 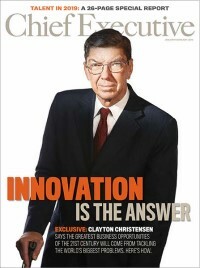 Also, later in the year, an in-depth benchmark report, detailing the process and metrics of the best companies for leaders will be available at www.ChiefExecutive.net. Quite simply, P&G executives are considered the Navy SEALs of management. This results in no small measure from a razor-like focus on internal succession planning at all levels. From its inception 174 years ago, promotion from within has been a hallmark of the company. It places a rigorous process on managers to develop managers below them. In general, your boss can’t be promoted until you are ready to be promoted. P&G scored very high in its internal development program, receiving the maximum points for the percentage of its leaders that are internally recruited as well as being referenced by others as the source of their external talent search. McDonald also personally looks at the top 300 to 400 executives and reviews the progress of key candidates with the board of directors. The most important element is short feedback loops that include 360-degree reviews where the system tries to prevent derailment. Failure is an option at P&G provided it’s caught early and analyzed for what went wrong. “We have assignments that test people, stretch them, but don’t break them,” offers McDonald. “We often put our best people in our toughest jobs and often they may not get great results because of the difficulty of the assignment.” McDonald learned this firsthand when he worked for P&G in Canada. After attending a number of focus groups there, he championed the idea of putting the company’s liquid products in film enviro-packs, which proved to be a non-starter in the marketplace and had to be discontinued. “I learned that what people say in focus groups isn’t what they will necessarily do at the point of purchase,” he says. Like GE, IBM and 3M, P&G sees itself as a learning organization. “We live in a VUCA world (volatile, uncertain, complex and ambiguous), which makes it impossible to know the future,” McDonald says. “So instead we create a learning system that prizes flexibility and adaptability. The only way to do that is to have an organization that is willing to admit when something goes wrong. Placement for each leadership role focuses on defining potential candidates, considering diversity for each opening. Placement decisions are accomplished through “5 Minute Drills” conducted at annual leadership reviews at all levels of the business. This company-wide process moves upward to high visibility “Chairman’s Reviews” with action follow-ups. IBM’s succession process has been a major reason it is one of the few firms that has lasted a century. It has one of the most closely watched institutionalized succession plans of any company in the world. This was evidenced by the smooth transition of CEO responsibility to Virginia “Ginny” Rometty from Sam Palmisano. She will become the ninth CEO since the company’s founding and its first woman CEO. This was no exception, as Lou Gerstner’s handoff to Palmisano was another good case study on leadership transition. GE established the quintessential executive training ground at its world-famous Crotonville, N.Y. facility—on which GE reportedly spends about $1 billion a year. General Electric’s John F. Welch Leadership Center marks its 55th anniversary this year. According to chief learning officer Susan Peters: “We have 13 offerings involving leadership skills that everybody should have, such as presentation skills, project management skills and understanding finance in a generic way.” These courses are managed through the Crotonville staff but are delivered at GE businesses around the world, including Shanghai, Munich and Bangalore, among other places. This is done through a Train the Trainer (TTT) concept. “The integrity of the course is maintained because the Crotonville staff ensures that the person teaching it has been trained and certified,” Peters explains. GE trains 50,000-60,000 people a year digitally and an additional 9,000 attend courses at Crotonville. It’s little wonder why so many other organizations covet the company’s graduates. 3M practices leadership development through assignment rotation; but, consistent with the study’s findings of other top-rated companies, it takes the approach that executives stay in a job for about four years in order to experience failure (the best teacher) and sustained success. Other companies often move people around every year or so, which yields a limited return on the development investment. 3M also focuses on leaders two to four levels below the CEO to develop and transition them into new roles. The company projects its commitment to leadership development on its website: “The premise is simple: If your people grow, your company will grow. The key: linking growth in individuals to those things that unlock energy and activities that our customers value. Leadership development remains at the top of the company’s agenda.” 3M CEO George Buckley spends over a fifth of his time on talent issues and teaches strategy and leadership to executives who meet twice a year. He also reviews what personal experiences executives need to improve their learning and advance their career. He says he prefers surrounding himself and the organization with people more capable than himself. Courage and a strong sense of ethics will take a manager far, he believes, along with the ability to focus and separate opportunity from peril. The board has been working on a succession plan with Buckley for well over a year in anticipation of his retirement in February 2012. An airline known for its low costs and high spirits, Southwest manages largely through its culture. It hires on attitude and enthusiasm and attempts to burnish this in a variety of ways, including The University for People (U4P), its corporate training facility dedicated to developing and delivering personal, professional and leadership curriculum. The Manager-in-Training (MIT) Program is a development experience for high-potential leaders who have long-term interest and future prospects within the company. There are two program levels: MIT I and MIT II. MIT I offers learning experiences and department visits that emphasize all aspects of Southwest Airlines and its culture. Participants experience 20-plus training sessions, including interactive exercises, assignments and visits by different departments within the company. Participants learn about various aspects of Southwest Airlines to give its workforce a better understanding of the “big picture” and what Southwest Airlines, as a company, is all about. MIT II focuses on leaders at the manager level to strengthen management expectations and build key leadership skills, such as strategic thinking and coaching. Building relationships with other managers, directors and senior leaders across the company is another invaluable experience of both levels of the MIT Program.